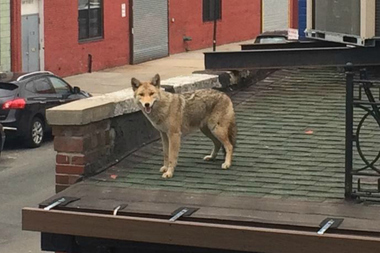 A coyote was stuck on the roof of the LIC Bar on March 30, 2015. NEW YORK CITY — Coyotes could soon make Brooklyn and Queens their home, as their population continues to grow and more parks open in the city. It's no surprise that three coyotes were spotted in the city within a three-week period, according to wildlife biologist Christopher Nagy, who co-founded the Gotham Coyote Project, which tracks the coyote population in the city. One was spotted on a rooftop in Long Island City on March 30, the second was found near a church in Chelsea on April 14 and on Wednesday another was spotted in Riverside Park. But soon, they'll start turning up in parks all over the city, Nagy said. “In a couple of years, we could have 20 or so [coyotes] living in almost every borough,” he said. Roughly 15 coyotes have settled in wooded areas and greenspaces in the Bronx, Nagy said. The number has been growing for the last few years, if not longer, he added. When coyotes are about 1 year old, they leave their dens to look for a new home. But when territories in Westchester County and the Bronx are filled up, they might start traveling south toward other parts of the city, according to Nagy. The city's greenspaces are also a draw. Parks like Riverside create pathways leading into urban areas, said Mark Weckel, the other co-founder of the Gotham Coyote Project and the Manager of Science Research Mentoring Program at the American Museum of Natural History. The peak season for roaming coyotes is late fall/early winter and late winter/early spring, Weckel said, which would explain the surge in coyotes spotted in the city in recent weeks. “It might soon be another way for New Yorkers to notice that spring is here: seeing more coyotes in the city,” he said. Coyote sightings became more common in Westchester County in the 70s and in the Bronx in the late 90s. Many of the hunters have been seen in larger parks including Pelham Bay, Van Cortlandt and Riverside, Nagy said. Last summer, the scientists observed coyotes in Ferry Point Park for the first time. “Since we started our project in 2010, we’ve observed [coyotes'] movements in new parks nearly every year,” Nagy said. New Yorkers shouldn't be afraid of the wild animals though, specialists said. "They're less dangerous than a dog," said Nagy, who was also quick to warn that coyotes could become aggressive if people started to feed them. In the parks, coyotes mainly hunt rabbits and other rodents, he said. The city tweeted a link Wednesday to information on "Living With Coyotes in New York City." In reaction to the most recent coyote sighting in Riverside Park, New Yorkers said they're delighted to share their home with the creatures. "I'm glad. It's wildlife and they need a place to live,” Morningside Heights resident Victoria Perez said. "Thank god New York is still livable for coyotes. More coyotes, less hipsters," said Joseph DeLeon, who was going for a run along Riverside Park on Wednesday. While Manhattan is too densely populated to make home, coyotes could settle down in suburban parts of Queens and Brooklyn, Nagy said. "They'll come through Manhattan but they won't stay in Manhattan permanently," he said.